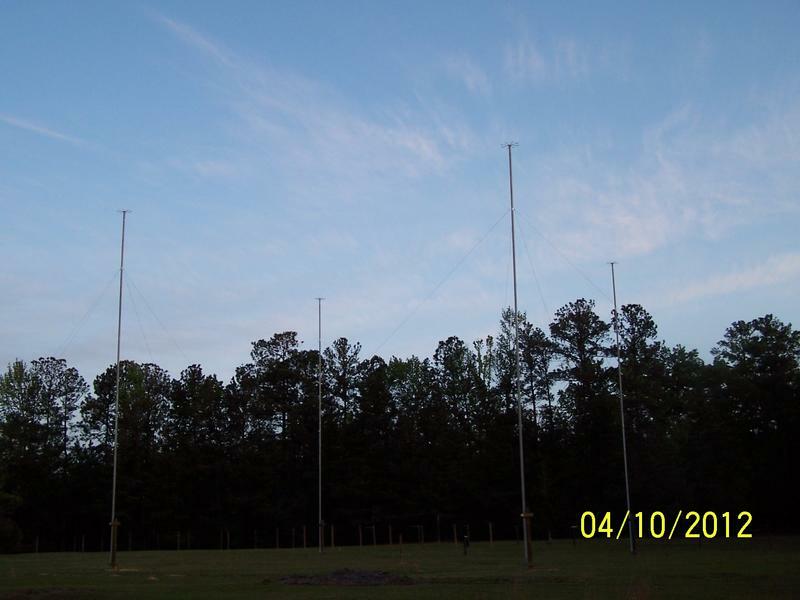 Pete, Brad WA8WDQ and I were recently e-mailing about our admiration for what Hans G0UPL has achieved with his QCX rig. I cc'd Hans -- we got this nice and very informative e-mail. Be sure to click on the link provided by Hans, and from there go to the link to his FDIM proceedings article. I think that article is a real masterpiece -- there is a lot of very valuable information in there. For a long time, getting quadrature output from the Si5351 seemed like an impossible dream. But Hans has obviously figured out how to do this, opening the door to much better and simpler single-signal phasing receivers. Thanks Hans! 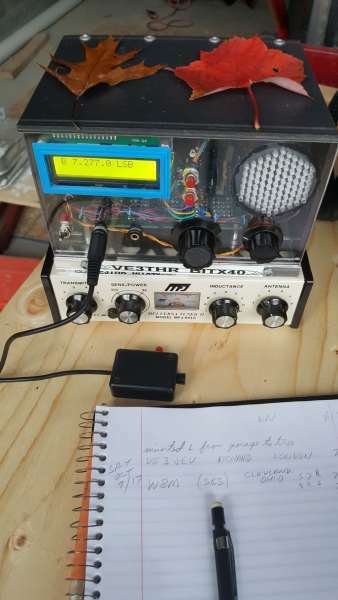 My seminar presentation audio was recorded by Ham Radio Workbench podcast and they will be publishing it on 5th June. The QCX kit has indeed been unbelievably popular, almost 5,000 kits have been sold since the launch on 21st August. 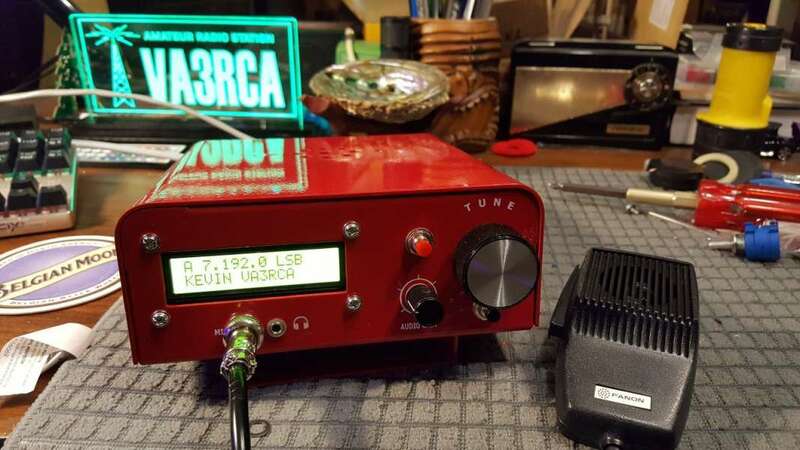 It seems to have itched an itch that needed itching, in the QRP world. Sales continue to be strong and I'm currently preparing another batch of 1000 more. 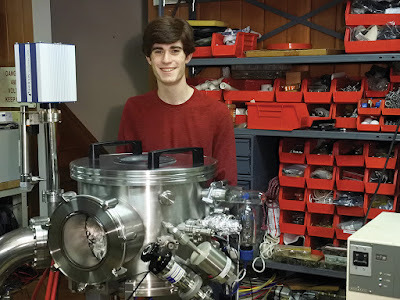 I'm very proud of my 90-degree quadrature Si5351A and it helped me towards my low cost, high performance target for QCX. 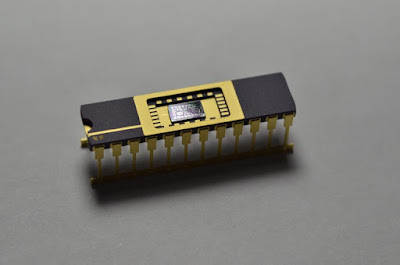 Abandoning the 74AC74 saves a part, reduces cost, reduces complexity, reduces board area (and hence more cost) and even seems to provide better performance (higher unwanted sideband rejection when using the Si5351A in quadrature mode). Getting the Si5351A to do this is one of those things which look easy afterwards. But at the time, and faced with SiLabs un-useful documentation, it took an awful lot of headscratching, trial and error! I'm not sure of the answer to the question about noise figure. Certainly radios such as QCX and the NC2030 which use the QSD architecture seem to have very high sensitivity without an RF amplifier ahead of them. This must indicate a low noise figure. Once again, our correspondent Bob Crane W8SX has gone to the Four Days in May event and has sent back some really great inteviews with those who made presentations there. First on the list was Hans Summers G0UPL. 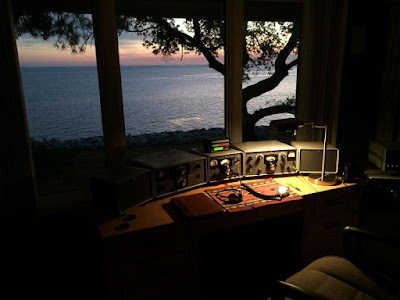 Hans is a justifiably famous Homebrew Hero, and a member of the QRP Hall of Fame. 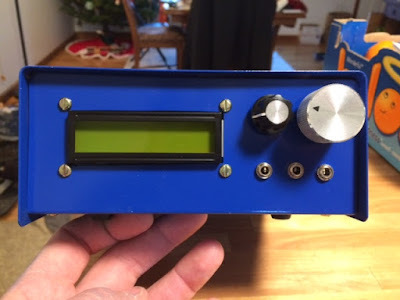 The latest of his many contributions to the hobby is his amazing QCX transceiver. Like the BITX rigs, the QCX refutes the idea that hams need to spend kilobucks to get on the air with a decent rig. Priced at around $50, the QCX offers excellent performance. 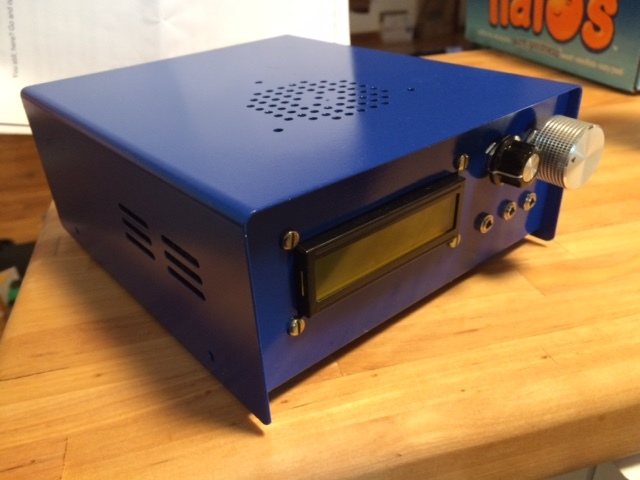 And it comes with built in test gear: the signal generator you need to align the rig COMES IN THE RIG! FB Hans. I think it was Pete who noted that the price range for rigs like the QCX, the BITX, and the uBITX is in the $50 to $110 dollar range, meaning that "One hundred bucks is the new three thousand bucks." We owe a lot gratitude to Hans and Farhan for this very positive paradigm shift. We all also owe a debt of gratitude to the QRP ARCI folks who did all the hard work that goes into organizing Four Days in May. 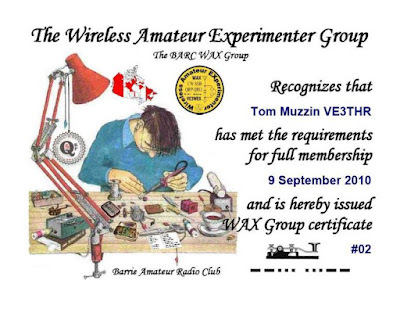 Special thanks to QRP ARCI Preston Douglas WJ2V, and to FDIM Chair Norm Schklar WA4ZXV. FDIM is one of the most important events on the Homebrew/QRP calendar. I had a good night on 40 meters last night. The Radio Gods were obviously with me. First I called CQ and VP2EIH on Anguilla responded. Nice to start with a whiff of DX. 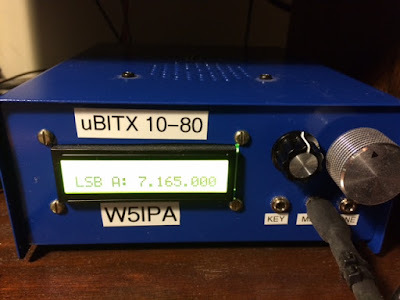 Then Jason W5IPA called in and said he wanted to try out his uBITX! See the pictures below. FB! Then I got a call from K5WDW on Hilton Head Island -- Dexter runs Collins gear from an ocean-front shack (see above). Check out his QRZ page. Then WA4PUB called in. 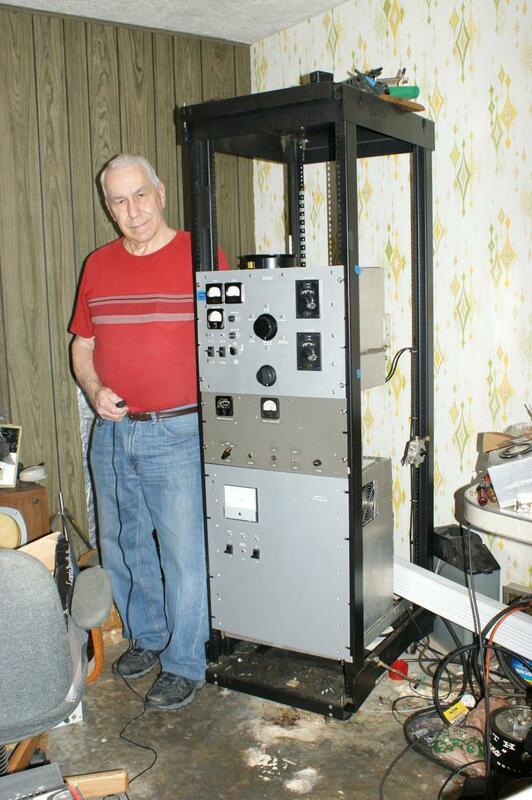 Dave has been on the air since 1948 and was a student of legendary ham and radio astronomer John Kraus. Dave has directional antennas on 40 -- when he switched the pattern he went from LOUD to barely detectable. FB. 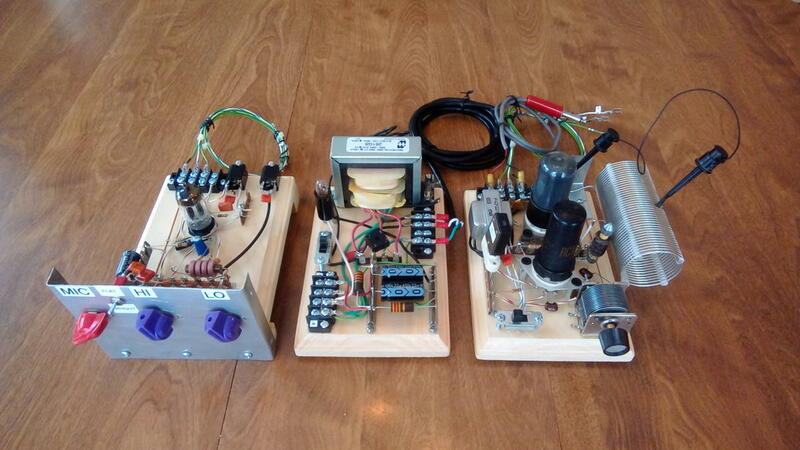 Check out Dave's homebrew rig below. Finally Gary W7DO joined us. He has a big 4 Square on 40 that also has some really impressive directional properties. See below for a look at his 80 meter 4 Square. I was about an hour late for the Eastern time zone meet-up at 7 pm local on 7277 kHz Sunday night (my wife and I watch 60 Minutes at that hour). but I figured I could work some guys if I got on at 8 pm. Sure enough, I was called by Keith N6ORS on his MIN-X rig. I was on my QRO DIGI-TIA. It was great to catch up with Keith. Then I got a call from VE3THR. Last year I'd talked to Tom when he was using his BITX40. This time he was on with his uBITX. FB. Tom's club in Barrie, Ontario is obviously melting a lot of solder and having a lot of fun. Here are some pictures of their rigs. Pete WB9FLW reminds us that Olivier F5LVG has LONG been using copper nails and wood boards to build amazing rigs. See above for one magnificent example. That, my friends, is a superhet receiver. Inspirational! Armand WA1UQO (perhaps reflecting his proximity to Washingotn DC) "Wire-Tapping"
Gary Hinson: "Coffin Dodging" (sounds a bit dodgy to me). Seventeen year-old Sam Zeelof, KD2ENL, is making his own integrated circuits in his garage. Wow. This makes me think about another seventeen year-old -- the fellow who appears on pages 63-64 of Cliff DeSoto's "200 Meters and Down." 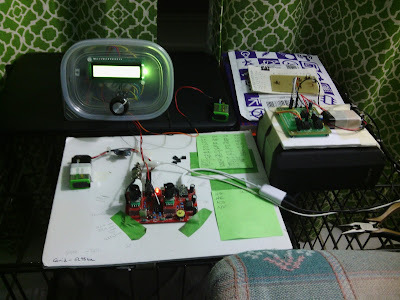 (I have the story on page 81 of "SolderSmoke -- Global Adventures in Wireless Electronics.") In the early days of radio that kid amazed us by making his own vacuum tubes. Sam Zeelof is clearly following in that tradition. No "mysterious black boxes" for Sam! No "appliance chips" for him! FB OM. Thanks to Bruce KC1FSZ for alerting us to this amazing work. A Construction Technique that REALLY "Nails it" -- But what do we call it? Thanks to Rogier PA1ZZ (long in W6) for this. I guess I have used a variation of this technique in some antenna tuner projects, and maybe in a crystal radio effort. This also reminded both Pete and me of the electronic project kits that we were given as kids. Those kits had little springs that were supposed to keep the components in contact. They might have worked better with nails. This technique definitely provides an opportunity for an earnest young guy to make use of his soldering GUN. I don't think a wimpy 35 watt iron would be up to the task. "Muppet Boards." What do we call this? On Saturday mornings (around dawn) I often listen to the Old Military Radio Net on 3885 kHz. I find it inspirational. This morning the inspiration was provided by Rick NN2K. His signal from Binghamton New York was makeing the trip to Northern Virginia. When I heard him mention that he was using a "Pine Board Transmitter" I felt the urge to look for a picture. QRZ.com provided the photo. 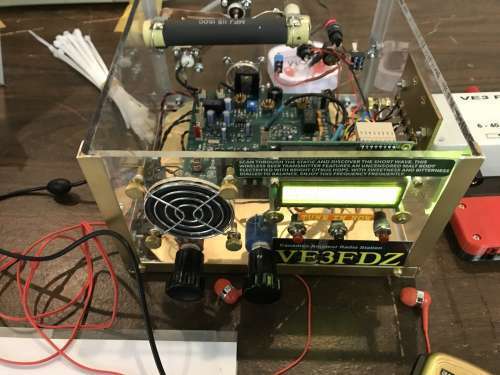 Rich says he built this rig in January 2018 based on a QST article by Bob Heil. FB Rich! And thanks to Ted W3PWW for running the Old Military Radio Net for so many years. 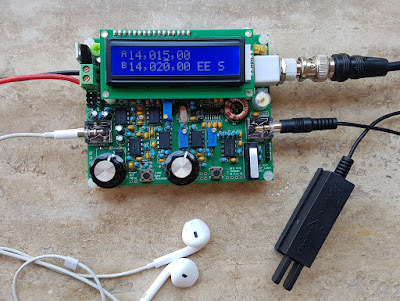 FB James -- Really glad you are listening, and that you are having fun with a Direct Conversion receiver --- souped up with a Raduino! You talked about using the Raduino with other radios. I bought one of Mike Hagen's RaduinoXs to use with my Bitx40. So, I have repurposed my original Raduino as a VFO for my 4SQRP ZZRX-40 DC receiver. I used Allards's v1.26 with a few code changes to tune 7.000 to 7.300. It's currently al fresco on a piece of Hobby Lobby foam board. I may "cabinetize" at some future date. Attached is a pic of the ZZRX-40, Raduino, and Goodwill Sony speaker with Jameco stereo amp, all running off of Harbor Freight 9v Nimh rechargables. So far I have heard over 40 states and 20 countries with a 65ft piece of wire in the rafters.